How it solves the problem? Businesses need ways to access local file server over the Internet from mobile devices and remote locations for productivity gain. 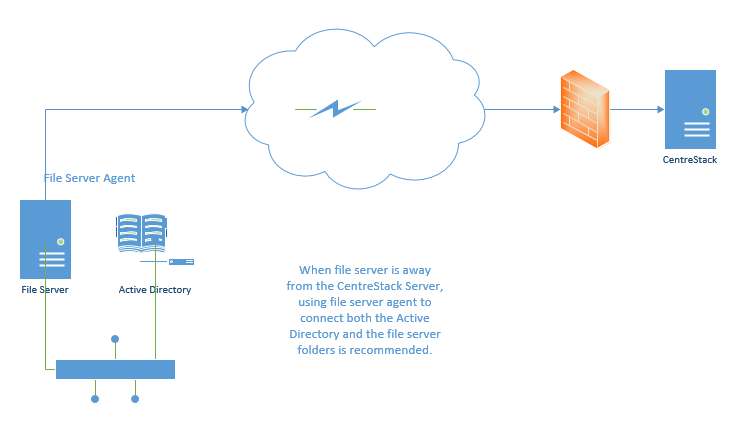 This trend is pushing local file server content outwards towards public file sharing services such as Dropbox and OneDrive. For example, employees are using 3rd party file sharing services on their own to be more productive. However, the security and control is becoming a big concern for businesses that are sensitive to regulation and data leakage problems. This is forcing companies to give up on public file sharing services by blocking them and revert back to traditional methods such as virtual private network (VPN) to access corporate data. However VPN has its own problems, which is not a good fit for a modern mobility and productivity friendly solution. This is where CentreStack comes into the picture, to combine the seemingly conflict interests of file sharing service, mobility and remote access, security and control , and resolve data leakage concern into one single product that takes care of the following objectives. CentreStack is the solution, while Server Agent software is one of the client agent software. CentreStack server agent is a client agent software that runs on Windows machines as a background service, while connecting to CentreStack servers. CentreStack server agent allows you to turn your file servers into cloud friendly servers to migrate the file server shares to the CentreStack side. During migration the existing share permissions are also migrated to CentreStack. Sever Agent technology turns any Windows file server into a private cloud storage that can be accessed from anywhere using any device using existing identities and permissions. 1. You or your Managed Service Provider partner (MSP) owns the CentreStack software. Data is on the local file server or is on the CentreStack server. Either way, you own the data to prevent against leakage and maintain full control. 2. CentreStack server either runs in a data center or in the local office, behind a firewall and facing the Internet. The Internet facing capability (HTTPS communication) makes it friendly to mobile and remote devices (as compared to SMB protocol). 3. CentreStack server either directly leverages the local Active Direcotry and NTFS permission or replicate them so to maintain file server accessing paradigm.